Online photo sharing has sextupled in two years. 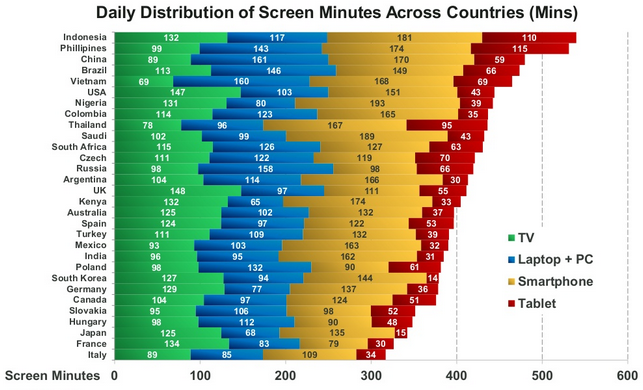 Nigerians are on their phones 30 percent more than Americans. 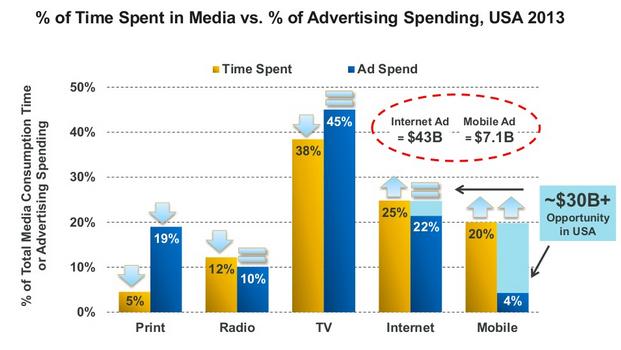 We now spend more time on mobile than on print and radio combined. Mary Meeker's State of the Internet presentation is a primordial soup for fledgling think pieces about the Future of Digital, and I mean that in a good way, actually. It's a 164-page slideshow of graphs and big-think proclamations about where our attention—and money chasing our attention—is going. 1. TV Still Rules. 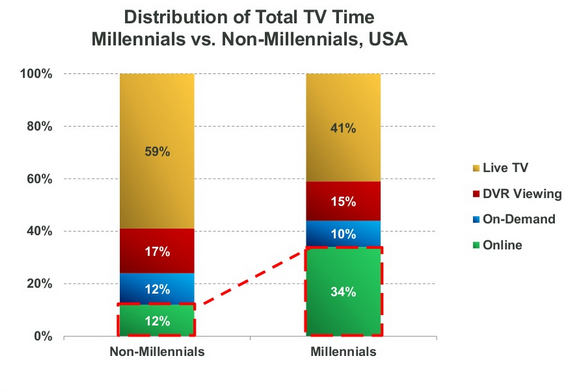 Compare this attention chart with its 2011 version below and you see something strange: TV's share of our attention has slightly declined, while its share of the American ad market has slightly increased. It's the only category that shares that dubious, dual distinction. Essentially: Advertisers like moving pictures on big screens even more than we do. 2. Print Is Simply Screwed. Over time, you could argue, ad dollars and attention tend to align, because companies simply want to be where the ears and eyeballs are. If that's true, print's structural decline is nowhere near over. Its share of attention fell six percentage points in the last two years, and there's still a cavernous gap between reading time and ad sales. The second chart that really struck me from the Meeker report shows the growth of the mobile biz since 2008, which has exploded from $2 billion to $38 billion. 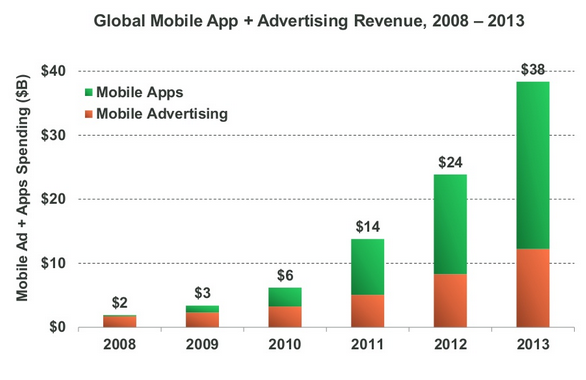 I never would have guessed that two-thirds of the mobile business comes from paid apps rather than advertising. It's an interesting reversal from the desktop ecosystem, where just about every Internet property I use is free and supported with third-party advertising. When you combine this graph (basically: Mobile is an app industry, with a side of ads) and the previous graph (basically: The future of attention is mobile), you begin to see just how important it is for media companies to promote high-quality apps for their stuff. It's a familiar story, but a powerful one. Eight years ago, Google and Apple didn't have a phone business. 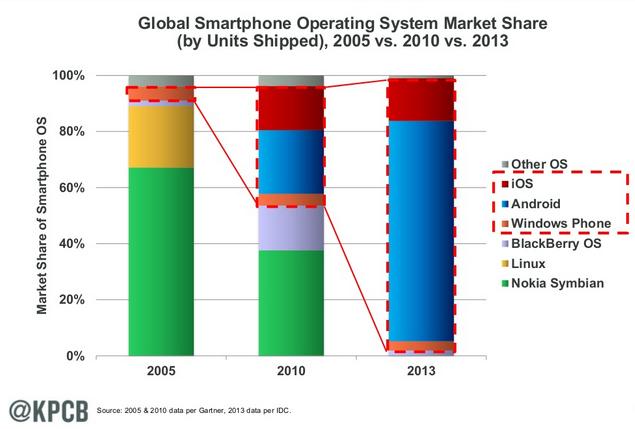 Now they make the operating system that powers just about every single phone shipped around the world. This raises a larger point about Google. Android OS powers about 75 percent of new units shipped. 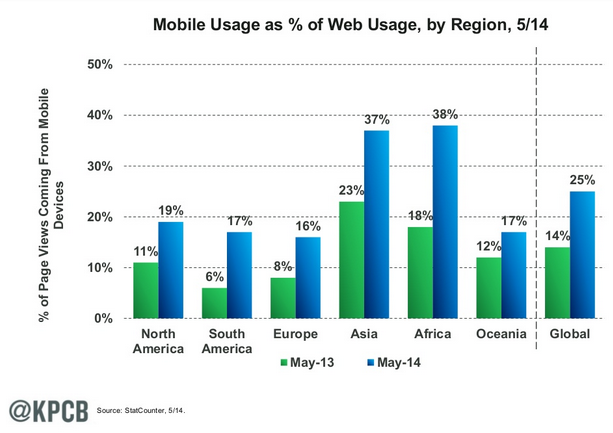 Google's mobile ads account for about half the global market, which is doubling next year. Google powers the world's phones and dominates the market of selling attention within those phones. If you're wondering why Facebook spent a bajillion dollars on WhatsApp and Instagram (and offered more bajillions to Snapchat), just look at this graph for a split-second. The Internet as you know is essentially a series of tubes optimized for facilitating the distribution of photos. Although Facebook's share of that photo market isn't growing, WhatsApp and Snapchat have exploded. This feeds into a larger point that Meeker makes in the presentation, which is that the mobile Internet has been a boon for discrete, simple functions. WhatsApp is simple. Snapchat is simple. Timelines are simple. Simple actions and interfaces are thriving on mobile, more than services like Facebook which offer a more complex suite of functions. 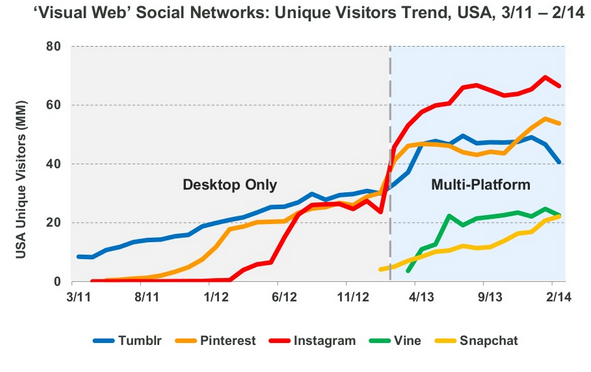 Here's another chart showing how mobile accelerated unique visitors at visual sites like Instagram and Pinterest. Three-inch screens are crap for reading, crap for typing, and crap for executing Excel macros. But they're divine for staring at a cascade of easy, pretty photos. 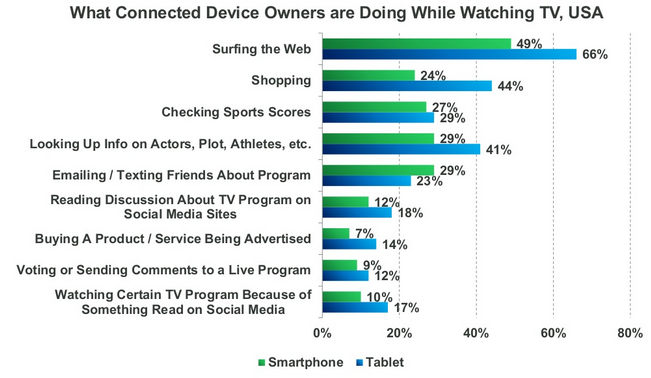 We don't just sit and stare: 84 percent of us are doing something on our phones and tablets with the TV on.